Colder months are Porter and Stout months, at least they are for me. The darker, roastier brews are just the thing for the cooler weather and so I opted to pick up a 6-pack of Boulder Beer Planet Porter from the Boulder Beer Company of Colorado. The Boulder Beer Company touts itself as Colorado's first microbrewery and has been brewing beer since 1979 which was right about the time I was old enough to drink beer (legally that is). Planet Porter is a dark, malty beer made with a combination of medium and dark caramel and black malts and is bittered with a mix of Cascade, Chinook, and Hallertau hops. The dark malt gives it a hint of coffee flavor but not overly so. It's ABV is 5.5%. This beer has won a few medals including a Gold medal in 1992 from the GABF and a silver from the World Beer Championships in 1997. Plus it just earned a bronze medal at the 2007 GABF in October! I opened the beer cold from the fridge and poured it into my favorite beer glass. There was very little head to this beer although it was not flat beer by any means. It has a very dark color and has a rich dark malty aroma to it. At first sip I could taste the rich dark malts. It had a smooth clean feel on my tongue with no after-taste. Some porters and darker beers feel chalky in your mouth and end up with a lingering bitterness, but not this one. While I was pleased with the taste and the aroma, I felt that something else was missing with this porter. Perhaps I've been spoiled by the vanilla porter I recently tried. Boulder Beer's Planet Porter is a good beer and I'd probably drink it again, but it was not as flavorful as I would have liked. Perhaps I'll change my mind after a 2nd one, but 1st impressions are important when choosing a beer to drink again. On my beer rating scale, I'll give this beer a rating of 3.3 out of 5. Love the label graphic - very classy. A dark starry night along the front range with a telescope and a big bucket of beer. What could be better? Well, cheaper price would be nice. I noticed that the hop and malt shortage is now driving up prices. I paid about 30 cents more per six pack than I used to today. I expect that higher prices will be the norm in 2008. Follow-up post: I had a 2nd beer later that evening. That time, the brew was a bit warmer and when poured had a huge head. Temperature has a way of altering the consistency of the head. The 2nd brew was much the same although it went down better while I was eating popcorn and watching a good movie on DVD. While the 2nd pour was slightly better than the first, I think I'll stick with my original rating. Planet Porter was good enough for a 2nd helping, but for me, I'll keep looking for an even better beer. 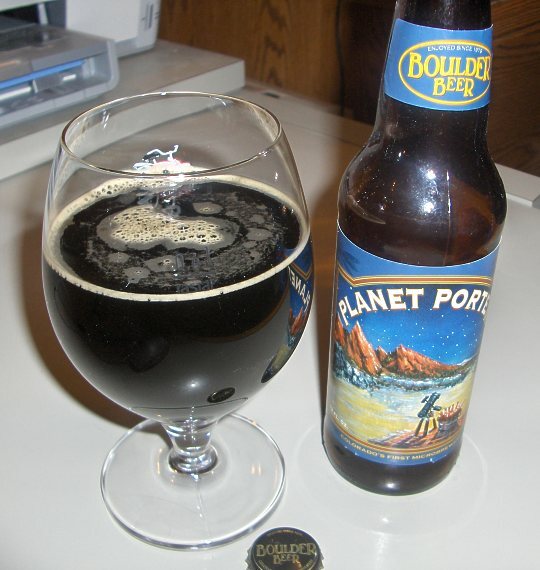 Update December 2013: Boulder Beer has decided to retire Planet Porter as of the end of 2013. Taking its place is the new Shake Chocolate Porter. - Boulder Beer opens tap house at Denver International Airport.